Meet the Veterinarians & Team of Hawkins Animal hospital in Milton! We’re pleased to provide exceptional vet care for your pets! Please call us at 905-875-6888 to speak to one of our caring veterinary staff members! 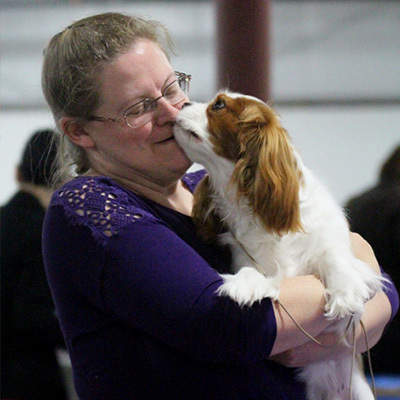 In starting my own practice, my goal was to actively promote well being for our pets. I strongly believe in preventive medicine, and I believe in educating owners with regards to their pet’s health. Much quoted, but so accurate, the saying that an ounce of prevention is worth a pound of cure, is always foremost in my mind. I also believe that a pet is an integral family member, with rights. In my opinion, if you own a pet, you have signed yourself up for being caring and committed, in a lifelong capacity, for that little being. A pet is for life! At this practice we offer an “open door” policy. We want clients to feel comfortable in our hospital, and we encourage clients to stay awhile and be shown around at the first appointment, or prior to an appointment. We also encourage clients to pop in with their dogs when they are passing by, as it is good for the pups to a enjoy cookie, get to know us, without being prodded or poked by me. Sadly, this approach does not work for the kitty fraternity! They are not so easily fooled by the cookie approach, as you cat owners will definitely agree. Please feel free to call us any time, for general advice, or to arrange an appointment. I was born with a stethoscope in my hand, so I am told. My father, Dr. Norman Hawkins, practiced veterinary medicine in Guelph, establishing The Guelph Animal Hospital. I have never wanted to do anything else other than to be a Veterinarian, and in particular, dealing with companion pets. I graduated from The Ontario Veterinary College in 1991, and for a few years, worked for another veterinarian, in a very busy practice. This was wonderful experience for me, from which I learned so much. 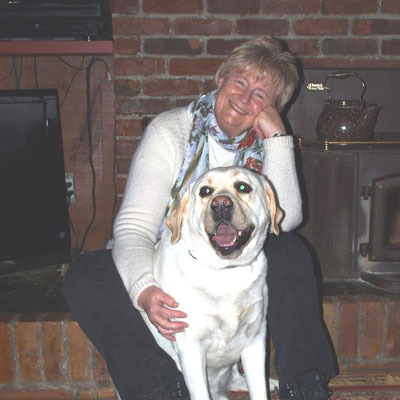 On Monday 5th October 1998, with the assistance of Ms Susie Baker, my Business Partner and Practice Manager, we opened Hawkins Animal Hospital. We designed and built the hospital from scratch, with a lot of guidance from my father. On our opening day we were fully booked, plus we had a few walk-in emergencies. Our biggest fear was worrying if the computer system would work on the day, and more importantly, if we could get our brains around the software. We need not have worried, as all went according to plan. We have gone from 1 Doctor, 1 Manager and 1 Veterinary Technician to 2 Doctors, 2 Technicians, 3 full time Veterinary Assistance and 4 part time Veterinary Assistants, and of course 1 Practice Manager. Dr Graham Balson joined the Hawkins Animal Hospital team in June of 2016. Following graduation from the Ontario Veterinary College in 1989, he spent time in a mixed animal practice before returning to the OVC for post graduate training. 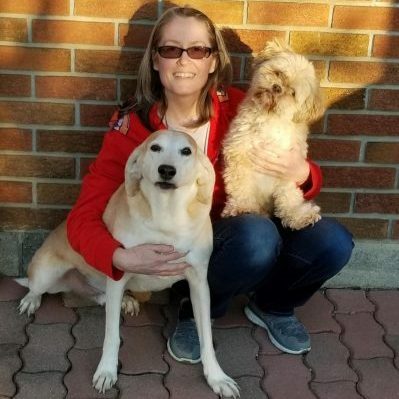 From there he entered the fast paced life of an emergency and critical care veterinarian working in several emergency centers around southern Ontario. He changed to work in general practice after starting his family in order to spend more time with his wife, their 3 children and their 2 dogs, 3 cats, pond fish and chickens. When not working or caring for their menagerie, Dr Balson enjoys playing hockey, skiing, swimming and hiking with his family. As Dr. Debbie’s friend and Business Partner, I am immensely proud of the fact that we opened the Practice on 5th October 1998, and that twenty years have flown by, seeming like only yesterday. Prior to opening the Practice, I worked for the UK Government, a job which took me around the World, but at the conclusion of that 30 year career, I decided to make Canada my permanent home, and have now become a proud Canadian. 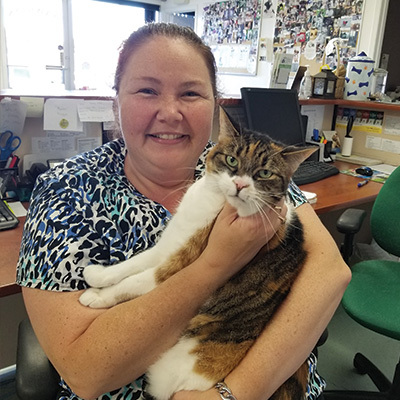 Like most of the staff here at the Practice, since childhood I have always had a strong love of all animals, both domestic and wild, and have always involved myself in supporting Animal Rescue, Adoption and Fostering. Since working these past twenty years as the Practice Manager, I have had the pleasure in working with so many amazing and dedicated veterinary technicians and veterinary assistants. Equally important, I have met and enjoyed long term client relationships, with hundreds of incredibly wonderful, caring and kind clients….. and of course, their pets!! I sadly lost my beloved old dog “George”, a little while ago, so the photo shows my neighbour’s Yellow Labrador called “Simon”. He is the most adorable boy with super energy and huge smile. It took a long time, from my arrival, to being able to photograph him, as he had to run around the house at 100 miles an hour, with his “hedgehog” before he deigned to be photograph. We were exhausted! I am one of the Registered Veterinary Technicians at Hawkins Animal Hospital. I graduated from St. Lawrence College in 2002. I have been working at Hawkins Animal Hospital since soon after my graduation in 2002. Most clients do not see me very often as I’m usually in the back either taking care of our hospitalized patients and/or drawing blood, taking x-rays, placing IV catheters, dental scaling and polishing, assisting the doctors with surgery and anesthesia, urinalysis and don’t forget sometimes the most objected to procedure by our patients the forbidden nail trim!. From time to time I am up front giving a helping hand to the girls up front or providing some client education. I currently have 2 pets that run my household; “Silas” a 5 year old French Bulldog crossed with “we have no idea” who has more energy and jumps higher than a kangaroo. But “Silas” is nothing but a 75lb big teddy bear to his little kids at home. “Jase” a year old Jack Russell Terrier, who enjoys nothing more than sleeping in the mornings but also has a “slight” obsession with balls and will play non-stop for hours. Jase just melts in the little hands of his kids at home. 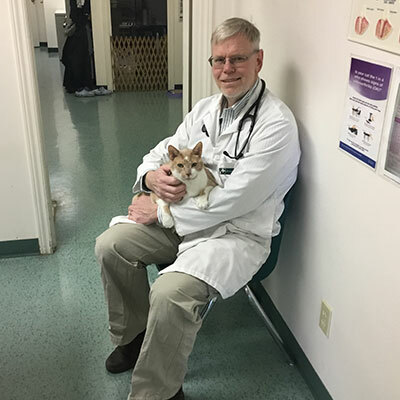 I have worked along side Dr. Hawkins for many years, both as we started our veterinary careers, and as Hawkins Animal Hospital was established. It is inspiring to work with a dedicated and skilled veterinarian who is devoted to her patients. The staff of Hawkins Animal Hospital makes every day worth it. I grew up around many different animals, from cats and dogs to horses, rodents and snakes. I have always had a passion for helping all animals and I was forever bringing home strays (including baby Robin's and abandoned squirrels). 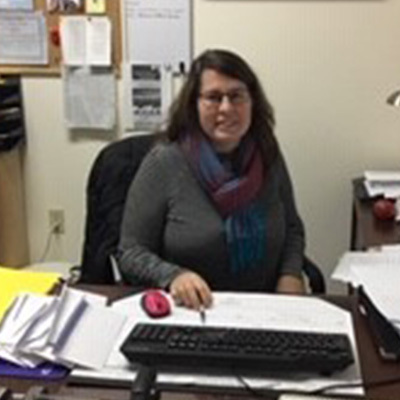 I have been working in the veterinary field since I was 15 years old and graduated from St. Lawrence College in 1997. I have worked in many different clinics over the years, including the opening of the Hawkins Animal Hospital in 1998. I took my journey to Toronto, where I worked at the University of Toronto. Many years later, I am excited to be back working with Dr Debbie and the whole team. I care for all of our patients as if they are my own. My passion for animals continues from my childhood, as we have a big mix of animals including cats, dogs, birds, tortoises, and a hamster. 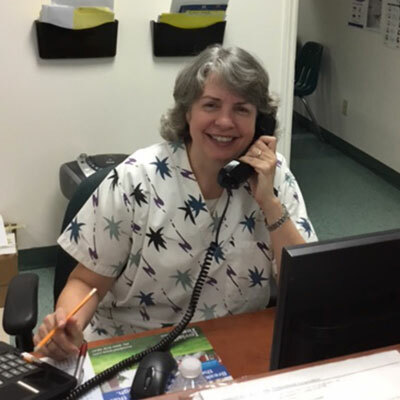 I am the friendly face, warm smile, contagious laugh and sometimes a shoulder to cry on that people have come to know since 2001 when I started my career at Hawkins Animal Hospital. I truly love doing what I do and interacting with the great clients and patients that we have. It really doesn’t feel like “going to work” everyday. I entered into this career through my co-op placement in high school and loved working animals so much that I knew this is what I wanted to do and I have been doing it ever since. I have had many pets in my life but currently I have 2 cats that are in charge. Oscar and Tim. Oscar is a large black cat who thinks he is a tough gut but Tim gives him a run for his money in being the boss. 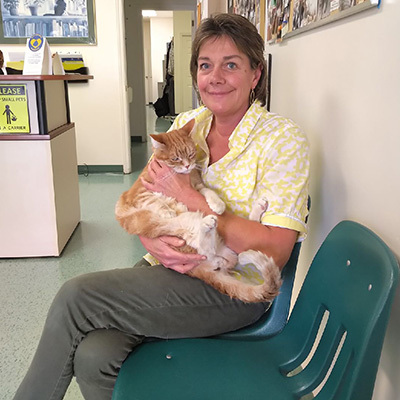 Tim is a brown and white tabby that was a stray that was brought in by employees that worked at Tim Hortons and found him in the parking lot – so there was no other choice but to name him Tim. 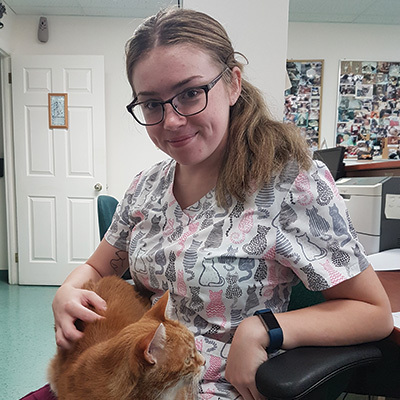 Hello, I’m Emma and I recently graduated the Veterinary Assistant program at Georgian College and just joined the Hawkins team! I began my work with animals at a young age through a volunteer program at the humane society and have been passionate about animals for my entire life. I currently have a little zoo of my own. 2 dogs (Sadie and Storm), 2 hamsters (Finn and Chewy), a little lovebird (Cheesecake), and a bunny (Houdini), all of whom are quite crazy but I wouldn't have it any other way. I am so happy to be working with clients and their pets, as this is something that I enjoy and have wanted to do for a very long time. 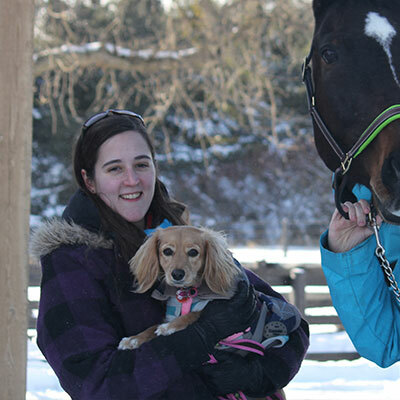 I graduated from the Veterinary Assistant program at Durham College in 2013. 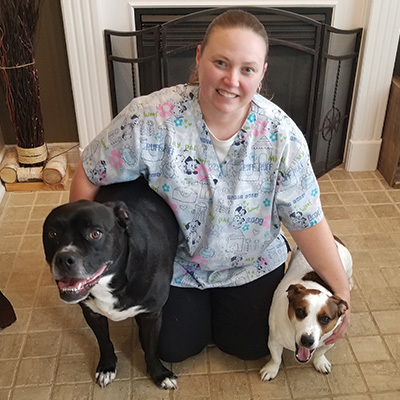 I have been working at Hawkins Animal Hospital since October 2017. I have a strong passion for animals and have been working with animals since I was little whether it be dogs and cats or horses. I have a 2 year old cockapoo named Sophie and a 12 year old Dutch Warmblood/thoroughbred cross named Garret. I can be found spending my spare time at the barn. I first started working at Hawkins Animal Hospital in 2017. I have always had a love for all animals, and since I was very young I have had a great interest in the Veterinary field. Once I finish studying Biological Sciences at the University of Guelph, I hope to pursue this dream, by getting into the DVM program. In the meantime, I am enjoying the practical experience of Veterinary Hospital work. I qualified as an RVT a few years ago but changed lanes completely and concentrated on raising a family. But you can't keep me away, and, the children having grown, I felt that I wanted to get back to my calling. I became part of ``the Team`` at Hawkins Animal Hospital, and have been here for more years than I care to remember. Hello, I’m Amy, and this is my first job in the Veterinary field. 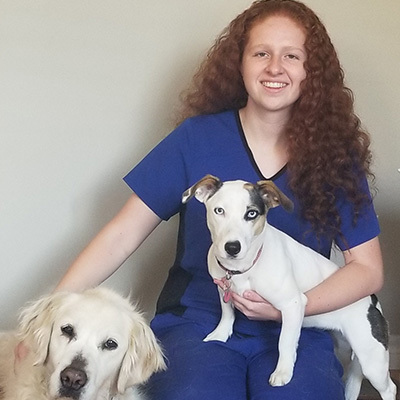 I graduated from the Veterinary Assistant program at Georgian College in August 2018 and hope to return to Georgian in 2019 to attend the Veterinary Technician program and become an RVT. Although I don’t have any animals of my own, I do enjoy spending time with my friends and family’s pets and hope to have my own animal companion in the near future!